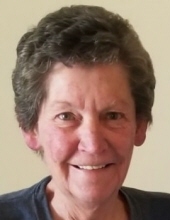 Sally I. Jacobsen, age 63 of Dixon, passed away on Saturday November 10, 2018 at Genesis East Hospital in Davenport. Funeral services will be held on Thursday November 15 at 10:30 A.M at St. Paul’s United Church of Christ in Wheatland with Pastor Tessa Cavey officiating. Burial will follow at St. Patrick’s Cemetery in Big Rock. Visitation will be held on Wednesday November 14 from 3-8 P.M at St. Paul’s. Sally was born on August 8, 1955 to Hein and Marie (O’Neill) Vander Heiden in Davenport, Iowa. She married Robin Jacobsen on October 11, 1975 in Toronto, Iowa. He died on March 28, 2001. Mrs. Jacobsen farmed in Clinton & Scott county with her husband, Robin and her family all her life. She enjoyed bowling, playing cards, watching coaching & helping her kids in sports. She cherished all of her grandkids, particularly visiting with them in her shop at the farm. Sally held a special spot in her heart for her nearly 100 nieces & nephews. Previously Robin & Sally were presidents of the Scott County Pork Producers, members of the Dixon Memorial Park Board, especially the annual 4th of July fireworks celebration, and volunteered for many local organizations. Sally was a substitute school bus driver for Calamus-Wheatland and painted with her best friend & sister, Kathy Nicely, for more than 20 years. Sally was the town ball representative for Dixon for many years. Finally, she was an avid Chicago Cubs & Iowa Hawkeyes fan. Sally is survived by her son, Aaron (Maria) of Dixon; daughters, Katie (Jason) Schroeder of Dixon, Sarah (Jeremy) Lawlor of Stockton, and Kelly (Zach) Mixon of Davenport; grandchildren, Jaden & Taylor Jacobsen, Lauren, Natalie, Kody, and Blake Schroeder, and Mya, Alaina, & Collin Lawlor; four-legged friend, Daisy; sisters, Regina Pewe of New Liberty and Kathy (Charles) Nicely of Wheatland; brothers, John (Wanda) Vander Heiden and Tom (Karen) Vander Heiden of Wheatland; sister in law Deanna (Richard) Vens of Wheatland;and many nieces and nephews. She was preceded in death by her parents; husband; two sisters; and a brother. To plant a tree in memory of Sally I. Jacobsen, please visit our Tribute Store. "Email Address" would like to share the life celebration of Sally I. Jacobsen. Click on the "link" to go to share a favorite memory or leave a condolence message for the family.